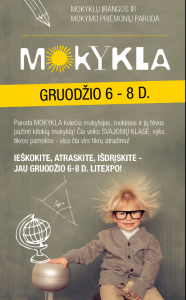 The third „Mokykla“ exhibition was organized on the 6th-8th of December. 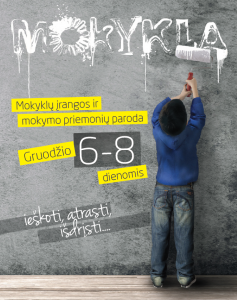 It was focused on the importance of creativity and innovation educating nowadays students. To reveal and present exceptional forms of school activities, to encourage them to share the best practices, the schools were invited to participate in the unique school contest: „Search, Discover, Dare“. „Teachers“ room was presented. It served not only as a place to learn about the most important trends in education, but also to discuss the daily problems, to find out about foreseen decisions in education policy, which will affect teachers, students and parents. Education Leader Forum was organized. It provided a unique opportunity for school principals and managers from a variety of educational institutions to exchange ideas about leadership and cooperation in education, to share the best practices and daily challenges, learn how education „lives“ in the world today.